How can a person be considered a computer? The answer to that question and many more are found in the work of Henrietta Swan Leavitt. Miss Leavitt's Stars by George Johnson served as the springboard for this discussion at the January 2012 Stars at Yerkes teacher workshop. It is sometimes wondered in our Stars at Yerkes talks, what inspires someone to become an astronomer. Since there are few first hand personal accounts from Henrietta Swan Leavitt herself, it is left to the readers of George Johnson’s book to make inferences from the wonderful collection of remembrances of Henrietta made by her colleagues at Harvard Observatory. Annie Jump Cannon’s quote (written above) came at a time when Annie traveled to the site of their telescope in Chile soon after Henrietta’s death. Annie may have shared Henrietta’s love of the beauty of the deep skies that must have yet existed in their day. This may have been her inspiration! It was also wondered about Henrietta’s personality. “Her sense of duty was strong...She was a devoted member of her intimate family circle, unselfishly considerate in her friendships...was possessed of a nature full of sunshine...” (S Bailey pg 28). Further trust in Henrietta and her abilities was seen when the director of Harvard Observatory Edward Pickering shipped valuable plates across the country to be analyzed when Henrietta could not travel. Clearly he respected her and her work. The morning session also treated participants with the reflections on the life of a “computer” by Professor Rich Kron. It was fascinating to hear of the similarities in both Katherine Gordon Kron's (Professor Kron’s mother) professional career as an astronomer and Henrietta’s! This also helped solidify a picture of Henrietta and her work. Stars at Yerkes teacher Elizabeth Ramseyer leads the workshop with describing the variability of stars. After our book discussion, participants explored different ways to analyze variable stars. 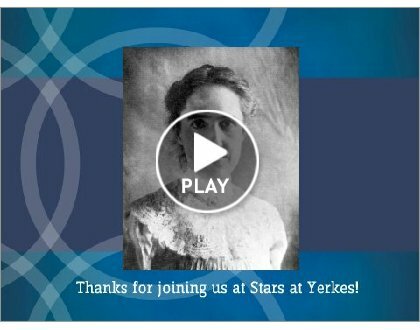 Stars at Yerkes teacher Kevin McCarron developed an analog version of the method by which Henrietta identified the variable stars. Kevin took two separate images of a variable stars (sscyg) printing only black on white and the other white on black . The white on black image was made into a transparency. Overlay these two images and voila! ‘With dense swarms of stars, it was impossible to check each one...Align them just so , so they would cancel (the stars) out-except for those stars that changed brightness’ (page 30). Next, we upgraded this analog experience by using a digital image processor. After lunch, teachers were given an excellent tour of the plate vault by Yerkes Observatory Director, Professor Kyle Cudworth. The images here are photos of NGC 6397 on glass plates, one of which was created using the Bruce 24 inch telescope in Chile. The close up view of NGC 6397 (as seen through the magnifier) was taken with the 13” telescope that was in Arequipa, Peru during Henrietta Leavitt's time. The notion of how the glass plates taken in these mountains, transported by mule, shipped by boat and rail to the "computer's" lab is truly incredible! To wrap up the day, Stars at Yerkes teacher Rich DeCoster taught us how to make a light curve using Afterglow. Using data taken with the Skynet network of robotic telescopes, Rich showed how the period of variability of stars can be determined by any student and their teacher. The workshop concluded describing the main astronomical impact of Henrietta Leavitt’s work, with a presentation of the Cosmological Distance Ladder. Without the countless hours of tireless work and the analysis of that data by Leavitt and the "computers, we would not know now that we live in a vast universe, and that our galaxy is but one of many. This site summerizes Leavitt's work and has a nice visual example of this: Cephids and the Distance to the LMC. Click here for additional images from the day.